Thanks for the thread. I just brought home a 2015 with 50k on the odometer. Previous owner skipped out on the 40k service and was just having the dealership do oil changes so I just did wipers, plugs, bled brakes, and replaced cabin air filter. Used the ICarSoft POR II to reset all intervals. Dealer quoted me $1500 buying the Motive Power Bleeder and ICarSoft I have maybe $300 into it all and $200 of that is new tools for future use. All super easy that most DIYers could do themselves. Plan to do oil change when it’s due. Will report back. Does anyone have any experience with AC service on the Panamera S-E Hybrid? I'm getting an intermittent hissing sound with the AC is switched on and think it's due to low refrigerant. In the past, with non-hybrid vehicles, I would just top off the system with a 134a recharge kit from the local automotive shop. With the hybrids using electric compressors instead of belt driven compressors we can't use the typical recharge kits because they contain PAG oil which will contaminate our systems which I believe need POE oil. I got found the below specs on the system, but under the OE compression oil type it lists "NA". From what I've read, we should be ok to recharge with "pure" 134a (without oil or stop leak additives). The ports are easily accessible so this should be an easy DIY with the right refrigerant. There is a product out there for 134a for hybrids, but i'm cautious about these universal products as I have a feeling they're geared towards Prius and doesn't list any specifics. Does anyone have any additional information or experience with this system. Dealer quoted $400 for recharge, but I can do for $20 if pure 134a (no oil/additives) will not harm the system. I don't want to pay for a recharge if I have a leak, which I'm guessing I do. I'd rather spend $20 to verify the leak and pay the dealer to fix it. Newbie question...How would you verify a leak? Would you be kindly to show us how to do it? We would appreciate for your contribution here. I mean how to change supercharger belt. Usually the leaks come from the condenser (radiator in the front near the air filter), but I would need to verify. There are many companies that offer 134a with a UV dye in them that will highlight the leak if present under a black light. This goes back to my original question though, that I'm not sure if I can use one of these dyed products either because of system contamination. To my understanding, our oil goes through the winding of the electric motor powering the condenser. Hybrid oil is non-conductive so in event of a short in the motor no current is transferred. If the oil would be "contaminated" with another substance (oil or dye) that is conductive then if there were to be a short in the system, unlikely but possible, some of that current could be transferred to the housing and create a shock hazard. Long story short, I think any of the 134a coolants will work and not harm the system, but create a safety hazard in the event of a short. Again, that's just my understanding from what I've been able to find. That said, I don't want to contaminate the system and find out the expensive way I'm wrong. Can you take a photo of the conventional battery? I need to see how the battery is attached by the harness that keeps it in place. 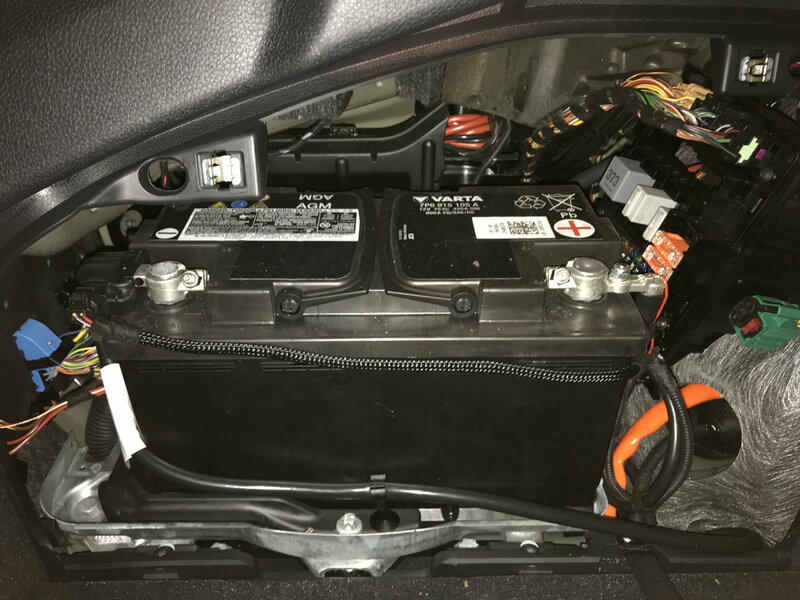 Who has changed their conventional battery? The Varta 92AH is too big to fit in!!! Last edited by Maxime75us; 03-02-2019 at 02:05 PM. The supercharger belt is so easy to change. Get the special wrench that you can rent at autopart store. Look for a good video youtube that shows how to swap it. so easy to do. and you have plenty of room to do it from the above. 5 minutes job. in order to save the memory. It took me 15 minutes to swap it. I haven't had to do this yet, but know the time will come within the next year or two...Thank you Maxime75us!